This march features the tune “We shall win” and portrays the belief that “if we fight in the strength of the King”, “We shall win”! This piece was written for the 125th anniversary of Horsham Corps at which the theme was “Building hope for tomorrow”. This theme provided inspiration for this work which features the tunes “Will your anchor hold?” and “Building up the temple”. An arrangement of the popular carol using the tune “Forest Green”, the tune most readily associated with these words. Vox Dilecti means “beautiful voice” and this arrangement of John B. Dykes’ melody of the same name complements words by Horatio Bonar, “I heard the voice of Jesus say; Come unto me and rest”. 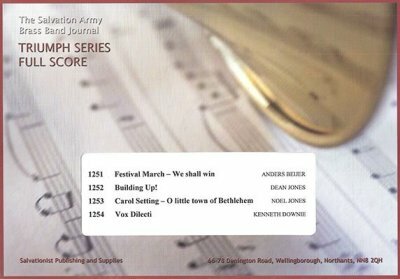 This article was posted in New Releases, Sheet Music and tagged Anders Beijer, Dean Jones, Kenneth Downie, Noel Jones, sheet music, Triumph Series, World of Brass on 7 November 2014 .